Maenlorn is a Bosmer merchant at The Flowing Bowl in Anvil. Maenlorn sells food all day, not eating or sleeping. He also sells the unique Fists of the Drunkard. He wears a middle-class attire consisting of a brown shirt, a pair of tan linens and some thick cowhide shoes. He also has a small amount of gold. The first time you meet him, he'll tell you about his twin brother: "Welcome to the Flowing Bowl. I'm Maenlorn. My twin's name is Caenlorn. How to tell us apart? I'm in brown. He's in blue. Simple, really." On subsequent meetings, he will be more brief: "I'm Maenlorn. I'm the twin in brown, remember?" If you ask him about Anvil before having finished the Thieves Guild quest line, he will tell you why Countess Millona Umbranox rules Anvil County all by herself: "The Count went missing about ten years ago. No one knows what happened to him. Lady Millona rules County Anvil. Her Ladyship has no intention of remarrying. Liked her first Count well-enough, I guess, and doesn't fancy a replacement." Later on, when Corvus Umbranox returns to the seat, he will say: "The Count went missing about ten years ago... but just recently he reappeared. It's a bit of a mystery, but the Countess seems pleased." During the quest The Siren's Deception, when Maelona and Gogan sends you to The Flowing Bowl, you can ask Maenlorn about the gang: "Yes, I've noticed some of them in my establishment. They don't break the law while they're here so there's nothing I can do. If you wait around long enough, I'm sure they'll show up." Maenlorn and his brother enjoys huge respect all over Anvil. When asked for rumors, the townsfolk will say: "Maenlorn and his brother run a nice establishment at the Flowing Bowl. ", "I like eating at the Flowing Bowl. Maenlorn runs a quality inn. ", "I like the Flowing Bowl. Maenlorn and his brother are excellent hosts." and "I've eaten many meals there, and I've always been satisfied." 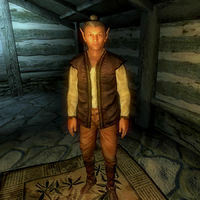 Maenlorn is one of several different non-quest related NPCs that may appear outside of any given jail when you serve time or pay a fine. Esta página foi modificada pela última vez à(s) 02h05min de 30 de dezembro de 2013.